Download Event Flyer, post in your school and email to friends and colleagues. Educators, please consider attending this conference! We are hoping some of you will present to your fellow educators. We should all fully support this wonderful event! Leave a comment for us or contact the event coordinators directly. Submit a proposal for a workshop by clicking here. We welcome you to the 1st annual Social Justice Educators’ Conference for Boston-area educators. The goal of the conference is to bring together teachers, graduate students and interested others to share curriculum and perspectives that address social justice issues in our classrooms, schools and communities. The conference will include panels, workshops & roundtable discussions facilitated by educators for educators. We’ll explore topics in our schools and communities, teaching methods and student-led activism. 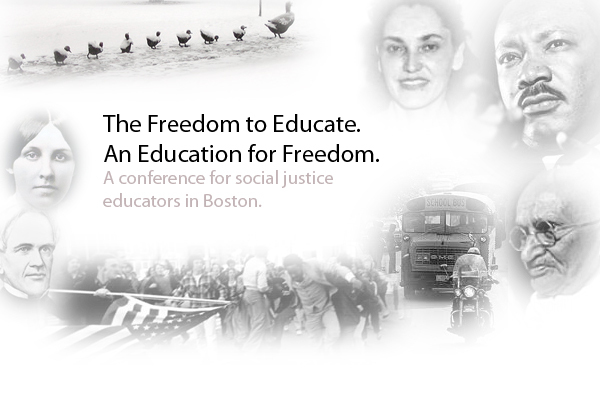 We hope that this conference will lead to the creation of a network of Boston-area social justice teachers. The conference will be held on Saturday, May 21, 10-5 pm. Our planning conferences have included educators from a number of districts. We are seeking more educators and students who are committed to social justice education to be involved in shaping this event. If you would like to be part of the organizing committee for this conference, please contact Roger Grande: besjinfo@gmail.com. If you know a teacher, educator or student that you think would be interested, please forward this note.